Staff Correspondent: The Supreme Court has given garment exporters association BGMEA seven more months to complete demolition of the 16-storey building it constructed illegally at Dhaka’s Hatirjheel. The five-member bench led by Acting Chief Justice Md Abdul Wahhab Miah heard a BGMEA petition for a year’s worth of time before making the decision at a hearing on 8 October, Sunday. In the order, the court said it gave seven months’ time to the BGMEA from September 12, which means that six months and four days are left for the relocation from today (8 October), Barrister Imtiaz Moinul Islam, a lawyer for BGMEA, told. The apex court said it will not extend the deadline for relocating the BGMEA building after the mentioned time. 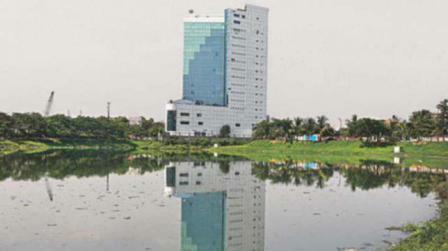 The BGMEA building was built about two decades ago on endangered wetlands in Dhaka. In 1998, the then Prime Minister Sheikh Hasina laid the foundation stone of the building. The construction began in the same year. The building was inaugurated in 2006 by Khaleda Zia as prime minister. In 2011 the High Court found that the building had been constructed by violating the law meant to protect wetlands and ordered its demolition. The court said the building was hindering the water flow of Begunbari canal and hampering the Hatirjheel project. A review petition on the decision was dismissed by the Appellate Division and the BGMEA were told to complete demolitions by Sept 12, 2017. The seven-month extension applies from that date. Prime Minister Sheikh Hasina has allocated about 3 acres of land in Uttara sector-17 for a new BGMEA building at a cut rate. The BGMEA petition for an additional year’s time was to complete construction of the new offices, BGMEA chief Siddiqur Rahman had said.